RotaKids is an exciting way for 7-12 year olds to enjoy working on important fun activities that will make a positive difference in school,the local community and globally. 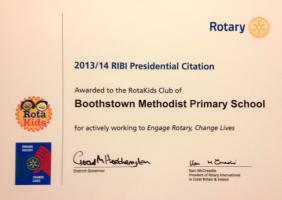 The Club has recently awarded its first Rotakids Charter Certificate. Trussell Trust foodbanks provide a minimum of three days emergency food and support to people experiencing crisis in the UK. The Club actively supports the Farnworth & Kearsley Foodbank based at Trafford Street,Farnworth and Cleggs Lane Little Hulton.